Imagine you’ve got two weeks until your dream holiday. You want to be fit as a fiddle. What would you do? Hire a ruthless personal trainer? Eat nothing but air for a fortnight? If you’re anything like our Salesforce Administrator Jin, you’d set up a planking club in your workplace. Yes, Perkbox’s beloved planking tradition can all be traced back to one woman’s quest to look and feel fabulous for her trip to Miami. Jin said it was ‘kind of selfish’ of her, but she’s being modest. It was a stroke of genius. Thanks to her, we don't just help keep employees engaged – we keep our cores engaged, too. 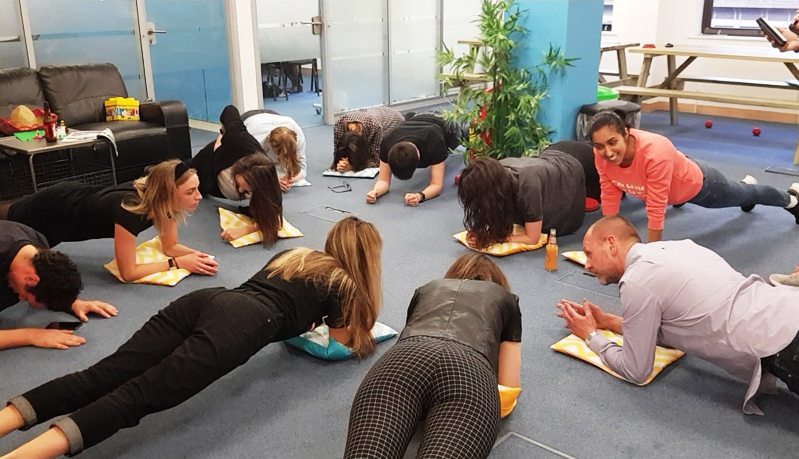 During the two week run-up to her holiday, Jin and her fellow plankers would meet three times a day for a full-body workout in our London office’s social area. They started off with a humble 30 second plank – which soon became a minute, then a minute and 30 seconds, and so on and so forth. Before we knew it, the gang were grating cheese off their abdominal muscles (not exactly hygienic, but impressive all the same). The two-week experiment culminated in a competition called the Plankfest. Over 20 Perkboxers took part, and even more gathered around to cheer them on.